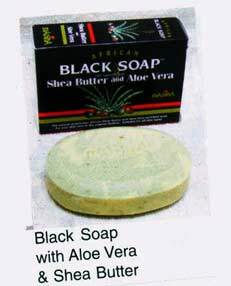 African black soap with Aloe Vera, Shea Butter and the combination of healing properties of vitamins A, D, and E. Are recommended to help and rejuvenate marks, blemishes, rough dry skin, facial, hand, body and effective in lightening and fading dark spots. Made in Nigeria. Available in Large Size Bar. (Save 30% on this item).